Blu from Bologna, Italy; the artist collective Faile from New York, USA; JR from Paris, France; Nunca and Os Gemeos, both from Sao Paulo, Brazil and Sixeart from Barcelona, Spain. You can also take the Street Art Walking Tour: an urban tour of site-specific art from a group of five Madrid-based street artists: 3TTMan, Spok, Nano 4814, El Tono and Nuria – a map will be available in the gallery. Various events will take place during the exhibition, including an interactive evening with experimental New York artists Graffiti Research Lab (see post below), refacing Tate Modern with graffiti light projections. 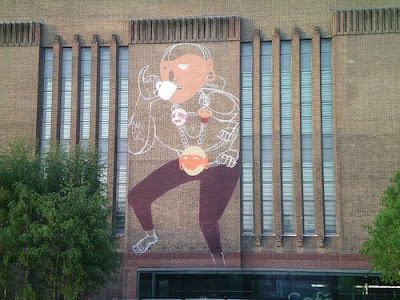 Street Art at Tate Modern opens at the same time as Tate Modern’s four day festival of art and performance, UBS Openings: The Long Weekend on 23 May and fits with the theme for this year’s event – States of Flux. Street Art has been curated by Cedar Lewisohn of Tate Media. A fully illustrated book on Street Art by Cedar Lewisohn will be published by Tate this month. The above image was photographed by Eddiedangerous who has a flickr set here of photos that he has taken of the last few days, as the artists make a start on the outside of the building.